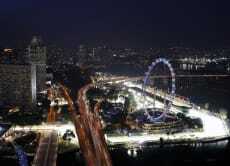 In its brief history so far F1 Singapore has gained the status of one of the most anticipated races on the F1 calendar and the only night time street race. As a street circuit, it is a much more immersive experience for race goers with onlookers right on top of the action and the iconic landmarks surrounding the Marina Bay street circuit serve as a spectacular backdrop to the high octane action. Against the night sky Marina Bay Sands, The Singapore Flyer, Gardens on the Bay and the historic Fullerton Hotel and Padang are illuminated as the cars speeds past. But it was lazy to take ticket.